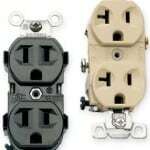 Conventional duplex electrical receptacles are connected to three electrical wires: a black “hot” wire, a white neutral wire, and a green ground wire. These three wires must be connected to the proper terminals on the receptacle. 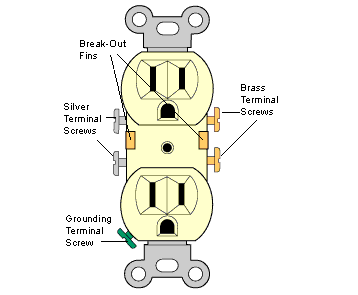 Please note in this illustration of a conventional electrical outlet that the device has brass terminal screws on one side and silver terminal screws on the other side (many receptacles also have push-in terminals on the back). It also has a green grounding terminal at one end. It is critical that only the green (or bare) electrical ground wire be connected to the green grounding terminal screw—it would cause a short circuit, a fire, or electrical shock to connect a black “hot” wire to the grounding screw. 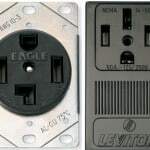 Connecting the black or white wires to the wrong side terminals of a receptacle can also be a problem. “Reverse polarity” is the term used to describe this situation. 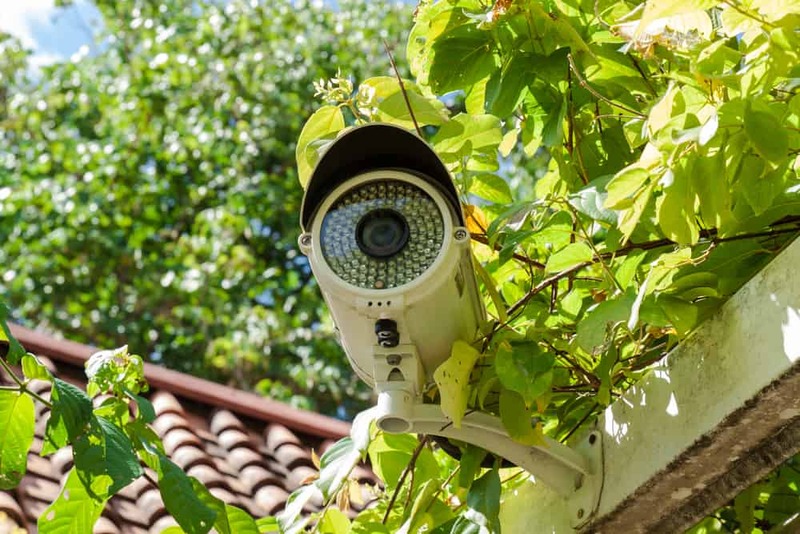 Though you generally don’t know the condition exists unless you look for this, it can damage certain types of electrical equipment. 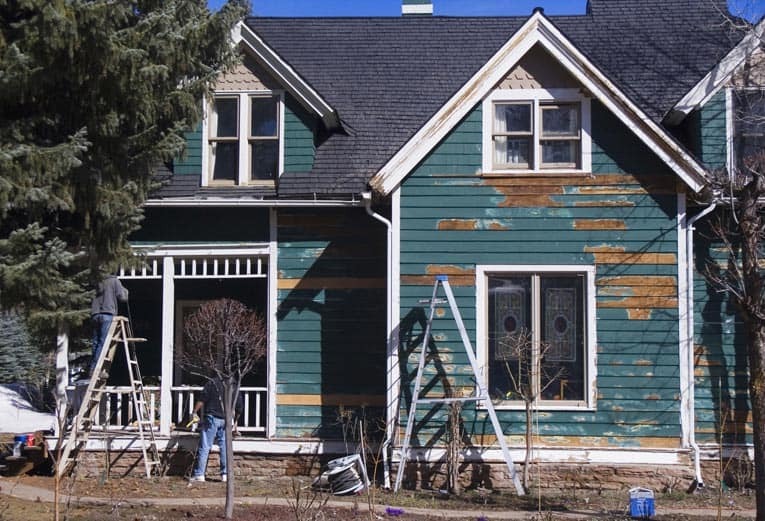 If you suspect your home’s wiring is a bit haphazard, it’s a good idea to check for reverse polarity. Simple circuit tester tells you whether or not a circuit is electrically charged and has proper polarity. You can buy a simple circuit tester for less than $20 that will determine if a circuit is live and has the proper polarity. 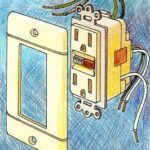 Just plug it into the top and bottom of every duplex receptacle. 1Shut off the circuit breaker that serves that receptacle (the tester’s lights will go out). 2Unscrew the cover plate from the receptacle, and unscrew the receptacle mounting screws so you can pull the receptacle straight out of the box. Use a voltage tester to be sure that none of the wires in the electrical box are still hot. 3Unscrew or release the black and white wires from the sides of the receptacle. If they are inserted in small round holes in the back of the receptacle, insert a very small, flat screwdriver into the slot next to them to release them. Then re-fasten them to the opposite terminals—white to the silver (neutral terminal) and black to the brass (hot terminal). Be sure the bare or green wire wire is connected to the green grounding screw. 4Push the wires back into the box and re-mount the receptacle to the box. Put the cover plate back on, turn the circuit back on, and test the receptacle again. If the tester indicates reverse polarity but the wires are hooked up to the proper terminals, call an electrician.